About the exact position of the jacking points on the Vantage. I just use the rubber blocks supplied with my Quickjack. I make sure that the block is middled on the bolt head at the jacking point. Quick question. Do you use Matt’s jacking pads with quick jack rubber pad? Or can you just use Matt’s jacking pad without the rubber pad? Even the short quick jack pads (you get a tall and short set) are too tall to use with Matt's pads and Matt's pads are too short to use alone. It just so happens that a small scrap of a 2x4 works perfectly to sit Mat's pad on. I have a DBS, and I am looking at purchasing a quickjack. I am interested in which model everyone is using? BL-5000SLX here, as well, but I went with the 12V power source for two reasons: first, the 120V power source was out of stock and I'd have had to wait for over a month; second, with a car jump starter pack (I got a NOCO Genius Boost Plus GB40 1000amp jump starter for it) it's 100% portable if I wanted to bring it to a track. It also lifts the car a little faster than the 120V system, but that's just a bonus. And I use only the pads that came with the QuickJack, to answer the earlier question. 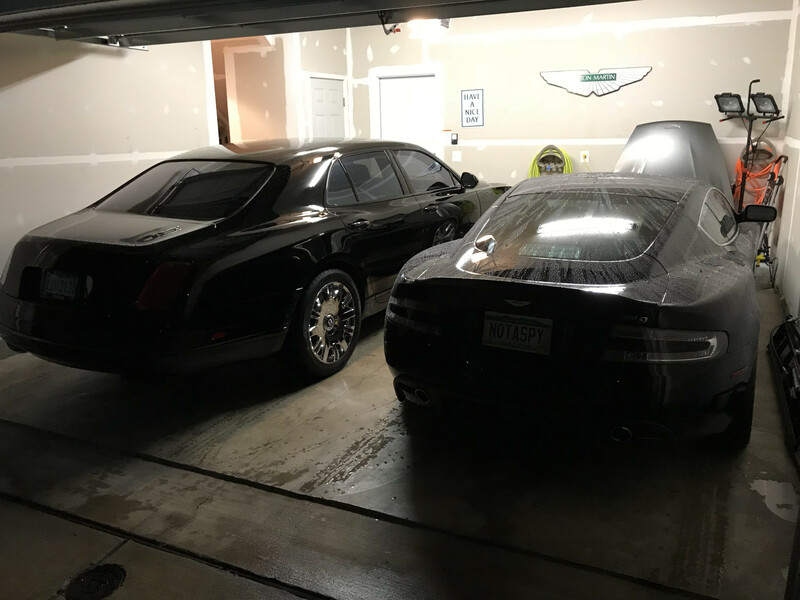 MRCW - I have the 5000# units and they JUST fit under the side sills of my Vantage. A friend has the 7000# units and they don't fit under my car unless I drive up on some boards. 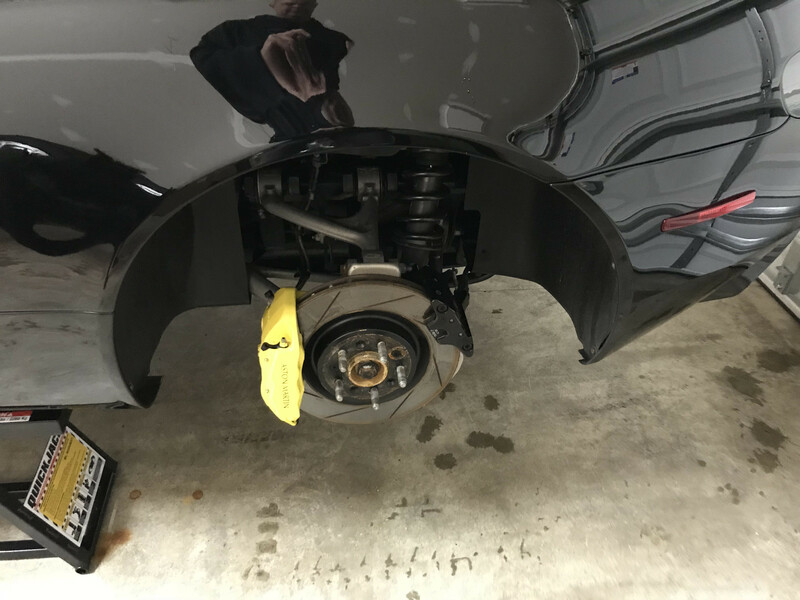 You don't need special jack pads but the included blocks are too big to fit under the car and also interfere with the side skirts a bit. You can just stack 2 hockey pucks at each jack point and that works fine. You can get hockey pucks for less than $1/each from Amazon. My 5k one will be here tomorrow for my DB9 on VAP springs. I got it due to worry the 7k one wont slide under. So hopefully I made the right decision. I also have the special pucks that i got on here to jack the cars up with. This will help me greatly on maintenance, detailing, and paint protection film for cars. Little late on this thread, but I've got the 7000 (also so I can use on my new Ram) and my V8V can drive over them with no problem. I don't use the provided blocks, just a scrap 2x4 and the custom lift pads by Matt here on the site. Finally got mine in and did my first project. Painted my calipers. I will do a DIY in separate thread for them, but I absolutely love the QJ 5k one. It slides under just fine with plenty of room to spare (my DB9 is on VAp lowering springs). The QJ came with 3" rubber pads and 4" rubber pads. The 4" wont work with the AM jack pads by Matt. The 3" do fine. However I have to slightly raise the QJ an 1" or so then align the pads. I believer Matt made them with the rubber o-rings so that they would stay in the holes so you can align a jack under the car. 1 of mine stays in the hole, the others fall out. Issue I want to rectify. Took me about an hour to affix all the high pressure hoses and joints, then set up the pump. Remember you need to have ATF fluid 2.5q on hand to fill the reservoir. Any synthetic ATF or regular works just fine. Also you must pump up 2x cylinders with 50lbs of air before use. Those cylinders took three quick pushes with my air compressor and they were full. Surprised me, it was that quick, so not much air, just the pressure. 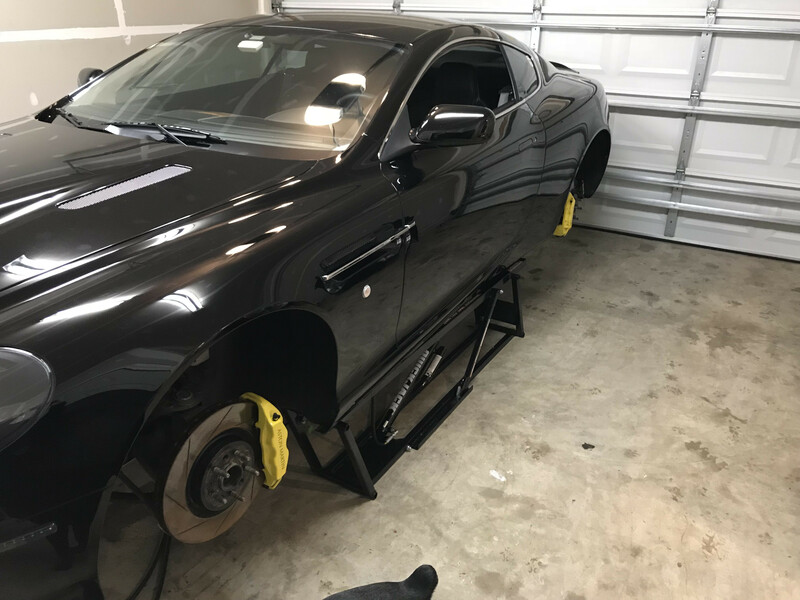 After running it up and down 3-4 times, I put the DB9 up on it after fiddling with the pads. Fast and easy to remove my wheels, then brake calipers etc..... Getting it back down, with wheels on it took no more than 10 min. Dropping it, pulling sides out and detaching the hoses and putting all of it away took no more than 5 min total. This is what mine looked like and with calipers freshly painted, then put up quickly and the other car in the garage.